Joan & Joni is a tribute to Joan Baez and Joni Mitchell performed by singer-songwriters Allison Shapira and Kipyn Martin. Allison Shapira is a “recovering opera singer” who recently found her authentic voice as a folksinger and songwriter. Kipyn Martin is an award-winning Americana singer-songwriter whose roots sink deep into the banks of the Shenandoah River. In Joan & Joni, Allison and Kipyn bring to the stage many of Joan Baez and Joni Mitchell’s well-known songs, as well as a few of their lesser-known gems, and demonstrate the effect Joan and Joni have had on their own development as modern musicians. Allison and Kipyn met at the Northeast Regional Folk Alliance (NERFA) conference in November 2013. Both classically trained singers and up-and-coming musicians on the DC-area folk scene, they soon realized their musical influences were similarly shaped by the folk revival music of the ’60s. Allison Shapira spent years studying classical voice at Boston University, Tanglewood and in Italy, but at home she listened to the folk revival music of Joan Baez, Bob Dylan and Judy Collins. In 2011, alongside a career in diplomacy, communications and international relations, Allison picked up a guitar for the first time and started writing her own music. Her debut CD, “Coming Home,” was recorded in 2012 and released at the very same Club Passim (then Club 47) where Joan Baez got her start in 1958. Kipyn Martin is a West Virginia native who now resides in the Baltimore area. Recent accolades include being named New Artist of the Year by the Washington Area Music Association in 2015 and winning multiple Gold Awards (2013/2014/2016) in the Mid-Atlantic Song Contest. Kipyn holds a Master of Music degree from the Shenandoah Conservatory and released her second solo project, Dance Across the Sky in 2017. In January 2015, Allison and Kipyn debuted Joan & Joni to a sold-out audience in Washington DC and released a “Joan & Joni” EP. 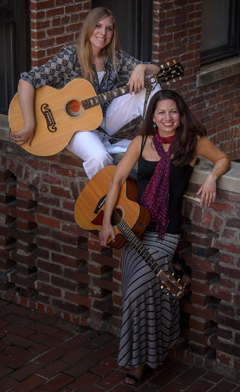 They have since performed dozens of shows at venues from New England to South Florida, including the historic Caffe Lena, Rockwood Music Hall, Rams Head (Annapolis) and the Woodstock Folk Festival.